This the third and last shot in my series of Stratford Blue vehicles it is fleet number 2 registration 669 HNX. A Leyland Titan PD3A/1 with a Willowbrook highbridge body dating from 1963. Interestingly as my second posting of the exposed radiator Stratford Blue Titan No.25 which had frontal damage this vehicle also has frontal damage a large chunk of its glass fibre front radiator grill is missing. Is it accident damage or a modification as I looks rather neatly cut? It was quite common at Yorkshire Traction for all three lower bars to be removed and replaced by wire mesh, as an aid to cooling, perhaps? The reason for the mod at Tracky was for a reason a little less technical!, the slats kept getting broken by ham fisted (footed? )conductors standing on them whilst trying to reach up and change the destination blind. More likely that it was stood on and broken when someone was changing the destination blind. This type of damage was often caused by the feet of crews as they changed the destination indicator. Salford a fleet with very high standards used extra long destination gear to prevent this type of damage. Yes Andrew, that less technical reason dawned on me just after I sent my original message! I can’t decide whether the "St Helens" glass-fibre front is a masterpiece of raw industrial design or just plain ugly. Similarly the LAD goods vehicle cab front, with which it – perhaps understandably – bears some affinity. Ah! but the livery: I’d allow anything in that – way better than the striped lilac shockers that now run my way. To pick up on Chris’s post of the 25th: it does look as though Stratford Blue had extended the destination gear . . . although not to the extent that Salford did, and with the consequences evident in the photograph. What was it about destination blinds that fascinated little boys? I remember being taken to an exhibition in 1956 to mark the centenary of my home town Rochdale becoming a County Borough. There was a mock-up of Rochdale Corporation’s bus destination gear in a big box on a stand and anyone was invited to play with the handles and set the blinds. Oh what bliss! I don’t remember anything else about the exhibition. I spent all day setting up the proper displays with number, destination and via details only for other kids to keep interfering and just winding for fun. Philistines! The diversion into the merits or otherwise of having blinds changed on the upper deck reminds me of the days when Southampton had a balloon festival, served by a special bus service, and I was usually the conductor on a Regent V – it meant a welcome change from driving my desk! At each end of the route, the blind had to be changed and, though it was a free service, tickets were issued, so there was plenty of running up and down the stairs. It’s an incredibly pleasant way of burning off the excess blubber! Some front destination blinds were changed by the driver inside the cab. It must have been in either Leyland or Weymann bodies, but I can’t remember which, (information, anybody?). A Maidstone & District PD2 was involved in what was then the worst ever accident involving a PSV, (it may still be), when it was driven into a column of naval cadets in Chatham. The driver claimed to have blacked out; M&D staff – I was told the story by a Gillingham dispatcher – suspected that the driver was distracted changing the screen as he approached the terminus. Philip, it’s a relief to know I’m not the only sad person on here! One reason for the fascination – and why I, for one, would always stop and watch mesmerised when a blind was being changed, was to catch a fleeting glimpse of rarely used destinations – including some that had fallen out of use because of route changes. But I think the other thing was the ability to fiddle around with a mechanical contrivance that worked better than anything you could build in Meccano. For the same reason, bells of all shapes and descriptions also fascinated me – and ticket machines. I remember that one, Roy, at the time. I seem to recall that he drove into the bus queue waiting at the stop. And there are no sad folk on this website, Stephen, only happy but eccentric ones! The story as I heard it, Chris, was that the cadets were marching in formation to Chatham Dockyard in the same direction as the bus, so weren’t looking out for it, and the combination of the badly lit road and their dark uniforms, (and, allegedly, changing the blind as he was driving), led to the driver not seeing them. BTW, while writing, thanks for your information about AFR Carling, (the recent WY posting). I met him once or twice – not always in the happiest of circumstances – and he had a lovely house right in the middle of my patch when I worked for Southdown. Okay, Roy you’re right – I’ve just looked it up, 1951 and 24 youngsters died. Sad business, doubly so if the driver did take his eye off the road. Glad you found my Southdown comments useful, he certainly had a memorable war, along with many others! Sorry to go off on another old-bus-photos tangent, but your remarks about AFR Carling, Chris, revived many long dormant memories. You’ve said he was Area Manager, Portsmouth, during WWII, and became General Manager in 1947. What about the intermediate post of Traffic Manager? How long was Mr Carling GM of Southdown before going to Stratton House, and who followed him? George Duckworth was GM in my time. Just a slight correction, Roy, the bus involved in the Chatham disaster was apparently Chatham & District 875 (GKE 69), a 1939 Weymann-bodied Bristol K5G. Chatham & District were absorbed into Maidstone & District c1955 and of the batch of 37 (870-906) the 25 surviving at the time became M & D DH293-317. One of the batch, C & D 874, has been owned by the Friends of Chatham Traction for many years – I believe it is currently undergoing extensive restoration. 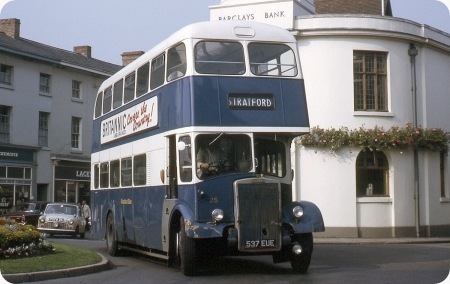 My second of three Stratford Blue pictures this one is of 537 EUE, an exposed radiator Leyland Titan PD3/4 of 1963 with a Northern Counties H41/32F body. gives the fleet number of this bus as No.37, but the picture shows the number 25 clearly displayed. The close up also shows that the vehicle has also suffered some accident inspired remodelling of the offside front wing. 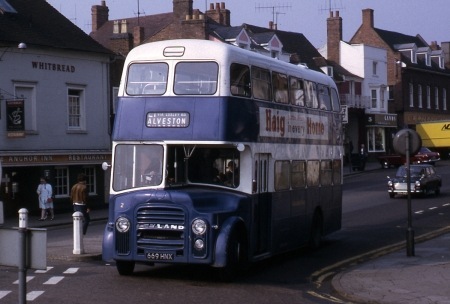 This bus was withdrawn in 1971, after a short life with Stratford Blue of only 8 years. A smart, (offside mudguard excepted), and purposeful looking vehicle, so much more attractive than it would have been with a tin front. Any idea, Roger, why it was withdrawn at so young an age, and what happened to it thereafter? It is also listed as 37 in my BBF 7 Midlands something strange. Not quite the pristine condition we’d normally expect of Stratford Blue. I’m guessing that the early withdrawal was either after another (serious) mishap or that its outline didn’t match the criteria of the parent company on take-over. After all, Midland Red are known to have kept very few of the vehicles of acquired fleets – those in the Leicester/Loughborough area being something of an exception – although I have seen views of SB vehicles in red. Agree with you, Roy. Amazing how many late (E, F, G registered) PD2s and PD3s were exposed radiator. Apparently this Bus is still in existence in Galway in Ireland. Owned by an open top tour operator (Lally’s) under the reg. no ZV 1466. It also spent some time on the Isle of Man. It wasn’t ‘withdrawn’ in 1971 as such- that was the date of Midland Red’s takeover of SB.The PD3s were totally non-standard for BMMO and the whole PD3 fleet was sold to Isle of Man Road Services, the EUE batch changing hands at the start of 1972. IOMRS withdrew it in 1982. The SB renumbering took place in 1969. (Info from R. L. Telfer (2003), Stratford Blue. (Tempus). 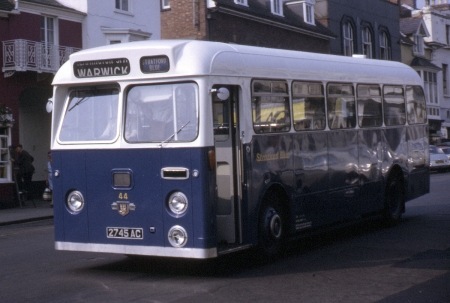 Midland Red sold as number of Stratford Blue buses to Isle of Man Road Services for further service all of which were Titans many with Willowbrook bodywork. Perhaps the most interesting disposal was a trio of Marshall Camair bodied Leyland Panthers that never turned a wheel for either Stratford Blue or Midland Red these ended up in Preston for a full life span. Interesting comment about late exposed radiator Leylands. Atkinson trucks also came like that then (any others? ): it was a sort of macho quality look and possibly a sign that the fleet was engineer led! That leads in a sort of way to BMMO buses, which seem to go too far the other way: the SOS FEDD recently featured is one of the most hideous buses I’ve ever seen (or not seen) – like an illustration in a children’s book…. to sit the driver on the fuel tank (!) and then have to put in a "peep" window over the filler…. and the proportions… words fail me. It fits with the all-red, easy maintenance but so boring look. This leads in a sort of way to this bus! I’m not sure it is so smart. Why was it sent out without a quick splash of paint to disguise the damage- and is that diesel slop under the filler?… and then the blind doesn’t fit the destination window… What I intended to say was that the numbers on Peter Gould’s list are all over the place (the fleet, not his list) and appear almost random: here they may have thought of a number & then followed the registration instead. Soon after, it seems, they started again. As the bus would say…. Here’s a photo of it in 2003 (look just above Canada). It is nice to see that this bus has survived, albeit in a "trepanned" state. I cannot understand why the full takeover of Stratford Blue by BMMO should have rendered the Stratford Leyland fleet suddenly "non standard". 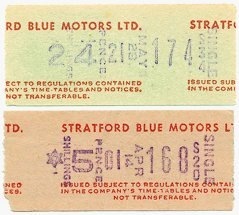 BMMO had full management responsibilities for Stratford Blue from 1935, and the fleet content was entirely a BMMO decision. If the Stratford unit could operate efficiently for so long, why should the replacement of blue and white paint by overall red suddenly rewrite the economics. BMMO in house bus manufacture had made decidedly dubious economic sense for some considerable time before the sale of the BET group to NBC in 1968, so the withdrawal of tried and trusted Leyland designs in Stratford in favour of BMMO standard types seems to have arisen from the increasing NBC fascination with the god of "standardisation" (corporate liveries and Leyland Nationals lurking just round the corner) than with operating logic. Standardisation for it’s own sake is not always a good idea, I cant see the point of wholesale changes just for the sake of it, however, in the case of the Routemaster for example, it can work very well, but even they weren’t all bog standard and had several variants. Most Tilling group companies ‘take overs apart’ had standard fleets, where as BET companies managed very well with ‘off the peg’ vehicles, then came the curse of NBC who seemed to go out of their way to prove that Oscar Wilde was right when he said "consistency is the last refuge of the unimaginative" end result? the MK1 Leyland National, how can you spend so much time and money on R&D and get it so wrong? I suppose they must have had some good points, but off hand I cant think of any. And the Leyland National body had an Italian designer, although we all recall the Mk II Morris Ital had one, too! In Gloucester, they had an all-Bristol fleet, of which the urban services were allocated RELL6L’s. But then Leyland Nationals started to arrive. Never a great Bristol lover, it was nevertheless obvious that the Nationals were inferior and a great disappointment. Strong structure, Ronnie. certainly wasn’t the engine! My experience of the Nationals is just the opposite of Ronnie’s – I never drove a Mk 1 but plenty of the Mk 2 variety. As a frequent passenger, and nearby pedestrian, I found the originals to be totally unacceptable – how on Earth they were allowed to make that horrendous screaming row from the large menacingly visible fan I shall never know, and I’m sure that ANY other model, new or ancient, which threw out such enormous amounts of acrid black smoke would have rightly received an immediate prohibition notice. On the other hand, however, I really liked the Mk 2 very much indeed. Weight distribution had been greatly improved, the dreadful 500 series engine banished, and the 600 series and Gardner power units were both powerful and positively "dulcet" in tone. The finest of the 600 type which I drove was one which had been bought from South Wales by West Riding – it was one of four which South Wales had fitted when new with comfortable luxury coach seats in fawn moquette and had an "open" exhaust system. Its power and sporty but pleasant bellowing became legendary in our operating area – its number, for those familiar, was CCY 817V and I wish I could do a few miles in it right now. I apologise for deviating from the Stratford Blue topic but, as we used to say as guilty schoolboys, "It weren’t me what started it Sir." You’ve described, Chris Y, to a ‘T’, my memories of the early Nationals. And the vehicles were so angular inside, especially the part above the top of the windows. The inside roofs soon became dirty, too, as if they were single-skinned. I think I preferred austerity bodies, on reflection! An altogether unpleasant vehicle that should never, in ‘Mk I’ form, have been put on the road. As ever, I’m in full accord with Chris Y.
BMMO did seem to have a strange attitude towards Stratford Blue: although Stratford Blue vehicles worked on X50 (Birmingham-Stratford) for many, many years the service was never jointly licenced and Stratford Blue always worked on-hire to BMMO; and, so I’ve read, Stratford Blue vehicles were never welcome at Carlyle works. Somewhat "distant" relationships between parent companies and subsidiaries don’t seem all that uncommon: Frank Briggs managed to maintain a degree of autonomy for Standerwick from Ribble; and until the GM of Northern assumed management responsibility for Sunderland District and Gateshead the managers of the smaller companies ordered their own vehicles etc . . . but the relationship between BMMO and Stratford Blue seems particularly strange. Did it perhaps date back to the Power/Shire era? Power was reported as having looked at Stratford Blue with "admiring eyes" – did Power keep Stratford Blue separate/"independent" and so out of Shire’s engineering remit? (the two are known not to have got on), and did that translate into the appointment of a Traffic Department oriented board of Directors which persisted through the company’s subsequent history? Stratford Blue itself had a strange approach to route numbering – when route numbers were introduced they weren’t applied to all services, and they were applied in leaps-and-bounds where they were. I’ve got a handful of Stratford Blue Setright tickets in my collection: some on pink paper, some on white – its my understanding that Stratford-upon-Avon depot used white ticket rolls and Kineton depot used pink rolls. And those Leyland Panthers that never turned a wheel . . . were they really a sound choice for a such a small company? – I can’t see that the traffic on Stratford-upon-Avon local services really justified dual-door buses. And weren’t those centre doors the cause of their "delayed" entry into service? I think that they had outwardly-sliding centre doors (now common, but then rare [Ribble specified them on some of its RELLs . . . anybody know of any others? ]), and it was problems with these that caused the Deputy Manager to reject delivery from Marshalls as he didn’t feel able to accept delivery in the absence of the Manager (who was absent on leave) – and then the company was wrapped-up before they could enter service. They were subsequently painted into "Midland Red" livery but were "blacked" by BMMO staff (and then spent the rest of their time with BMMO parked out-of-use at Digbeth Depot’s Adderley Street over-spill parking area): which raises two questions – why did BMMO apparently intend on keeping these non-standard vehicles when the rest of the Stratford Blue fleet (including some quite new Atlanteans) was disposed of PDQ (although, given, they did repaint some Titans that didn’t stay long)? and why did BMMO crews refuse to work with the Panthers? (was it because they were dual door? – but then BMMO had its own dual-door DD11/12 Fleetlines). It was nothing to do with being ‘blacked’ by Midland Red drivers. The Panthers were parked up at Adderley Street in Birmingham to await disposal after the West Midlands Traffic Commissioners refused approval of the plug in doors on safety grounds. Other area commissioners did not have a problem with them. 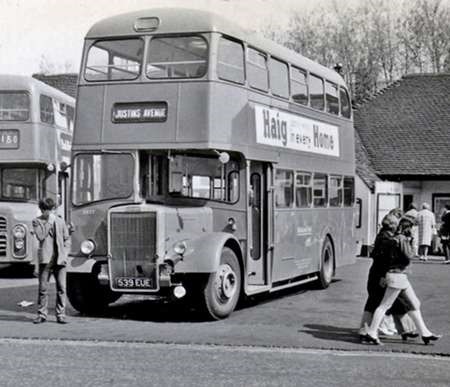 As a matter of interest the dual door Fleetlines were soon operated as single door buses with the centre doors fixed shut. This was due to even moderate nearside crosswinds opening the centre doors and disengaging the gearbox whilst bus was in in motion. The doors were controlled through the semi automatic gear stick and set up so that the bus could not be driven with the centre doors open. If anyone misses the noise from Mk1 Nationals come to Leeds and follow one of the ftrs they are noisy! Sister bus 539 EUE seen at the Red Lion bus station, Stratford. The young gentleman seems to have his attention elsewhere! In his comment upon Michael Bishop’s posting of the Isle of Man Road Services Leyland Tiger Cub with a Willowbrook DP41F, Ian Wild refers to the very similar Stratford Blue Leyland PSUC1/1 Tiger Cubs. Pictured in August 1970, this is No.44, 2745 AC, the one with the Willowbrook B45F body – the other four had DP41 seating configuration – and, I think, it is our first picture on the site of a Stratford Blue bus. The early history of the company is rather complicated, but by 1931 it was operating as a Balfour Beatty group business with second hand vehicles, as Balfour Beatty refused to finance new purchases. In 1935 the BET group assumed control, with management passing to BMMO, a situation that continued until the BET sold out to NBC in 1969. NBC set about absorbing its newly acquired smaller operators into the bigger neighbouring companies. From 1st January 1971, Midland Red assumed full control of Stratford Blue, and buses were progressively repainted into the BMMO overall red livery. Here is a link to read the full history of Stratford Blue. What a beautiful glossy finish. You don’t see that very often – and you rarely saw it in NBC days. It seems strange to me that some operators manage to keep this sort of finish and others can’t. It can’t simply be the difference between whether vehicles are hand or machine washed. On that point, David, when I was with Tynemouth and Wakefields, prior to NBC all Northern group buses were hand painted, this involved several coats of primer and paint followed by a final coat of varnish, the drawback was cost and the fact that the whole process took about 10 days, these days much of what you see is just stuck on graphics. cost effective, but no where near as good a finish. A very nice photo of a small’ish concern who always took a pride in their vehicles and ploughed their own furrow, in spite of being a BMMO subsidiary for some 40-odd years. They were great advocates of Tilling-Stevens B10’s before the war and I recall visiting an aunt around 1949-50 and seeing these strange-sounding antiques. I didn’t fully appreciate them, truth be told. Later, they were equally keen Leyland users, of which the above is a good example. Peter Gould’s website contains a potted history, taken from the book "Stratford-upon-Avon Blue Motor Services Remembered", by David Harvey. I can’t help thinking that the picture gives a good impression of how Samuel Ledgard’s fleet would have looked if they had taken similar vehicles. It certainly does look in remarkably good fettle for an 11 year old bus – one could easily believe that the photo was taken to mark its first day in service. As Chris states, despite being under the wing of Midland Red, they went their own way – especially regarding vehicle policy. Their BET Federation style PS1’s and Tiger Cubs, and the Northern Counties rebodied PS2’s were more reminiscent of Yorkshire Traction – a company about as far removed from Stratford Blue as I can imagine. I’ve heard it said that the BET Group retained some smaller outfits such as Stratford Blue, Hebble and Mexborough & Swinton in order to allow junior managers to gain experience and prove themselves on a small scale before being let loose with a larger company. Only one word to say about the photo – stunning, absolutely stunning! That’s three, but who’s counting. As others have said, a beautiful livery – strange how something as basic as blue and cream can look beautiful, but it did – immaculately presented on a classic design. In addition ‘Stratford-upon-Avon Blue Motors’ has such a wonderful ring from a more elegant age. And Ronnie, I agree with every word you say about Northern Group liveries. I was sad when Gateshead adopted green and cream in 1964 thereby making them look the same as Tyneside; I may have been in a minority in loving the old maroon/brown and cream but I thought it was really smart and it was distinctive. In mentioning the end of separate liveries with inception of NBC you might also have mentioned the revolting yellow which got slapped all over buses based in Tyne and Wear soon afterwards; strange how Newcastle Corporation’s yellow and cream looked really smart and yet Tyne and Wear’s didn’t seem to look good on anything! Another well-kept vehicle in a small fleet despite, as others have said, being a division of Midland Red for so many years. Looking closely at the picture reminds me that Stratford Blue were among a very small number of (usually small) operators who used the service number box to display the name. I may be mistaken, but I think Stratford Blue were wound up after pay/conditions were brought into line with BMMO – there was a strike about this issue. Why the company couldn’t have been allowed to continue with staff on an equal footing with the parent escapes me, but then around this time NBC was intent on wrapping-up its smaller operations – were there administrative costs, such as posting of accounts, involved in running subsidiary companies? Whatever, it was a shame to have lost a "blue company" – although NBC’s (lack of!) policy on corporate blue liveries would have seen to that in due course anyway. Red "Statford Blue"? : reminds me of when Western National was split by NBC and Bob Montgomery had those members of his new North Devon operation – trading as Red Bus [sic] – which were still in Leaf Green lettered as "This is a RED BUS" (as opposed to the "RED BUS" fleetnames on the red members of the fleet). "This is still a STRATFORD BLUE bus" (on Poppy Red vehicles) doesn’t have the same ring though. Although with NBCs policy of shortening fleetnames – Cheltenham District/Cheltenham, Bath Services/Bath, Maidstone & District/Maidstone (on coaches), Mansfield District/Mansfield – red "Stratford" buses wouldn’t have been so silly. Back to the bus though – the whole thing’s just right isn’t it? livery, vehicle design/proportions . . . and a nice linen destination blind – class. But does anybody know why Stratford Blue was "allowed" to pursue a Leyland-based vehicle buying policy? One assumes that the Directors were all senior BMMO officers, so why didn’t they insist on purchase of BMMO products? Was it because the Leyland purchases by Stratford Blue provided a bench-mark against which BMMO products could be judged, as I’ve read? – but then they weren’t being operated over comparable routes and BMMO operated Leyland vehicles in its own fleet anyway; or was it because BMMO couldn’t meet its own requirements from internal production and Stratford Blue had, of necessity, to look elsewhere? Alan, I prefer not to think about the NBC version of T&W yellow, and the PTE went on a very expensive experiment with various layouts of Newcastle Corporation’s original livery only to end up with something not a million miles from where they started, in fact I would be surprised if most of the population of Newcastle knew the difference. …..but just be thankful that you didn’t end up with something like South Yorkshire’s "Coffee and cream"! Even when the coffee was strengthened, it wasn’t a patch on Sheffield’s cream with blue livery and it only became vaguely bearable with the eventual addition a red. Yes, the right combination/shade of blue and white/cream do make a very attractive buss. My Western Travel post shows a dual-purpose Gloucester Bristol RELH6L in similar guise, although their bog-standard all-over blue with thin white stripe between decks looked uninspiring. Chris B – how right you are with the Ledgard comparison – in fact there was once an edition of an Ian Allan publication which featured a Stratford PD2 and I for one had to glance again quickly, thinking that it was a Ledgard view. I can’t just recall whether it was a "Buses Illustrated" or one of the annuals. A lovely picture but it would be a mistake to think this is representative of how Stratford Blue buses looked in their later years – what it does show is No. 44 fresh from the paint shop in the blue and white livery that replaced the earlier blue and cream from 1969 onwards. In their later years the Tiger Cubs were unreliable, unloved and often unkempt, and consideration was given to replacing them with used buses from elsewhere, but it never happened. There were 14 Tiger Cubs in the fleet, with Willowbrook, Park Royal and Marshall bodies. They all passed to Midland Red on 1 January 1971 but were withdrawn by May, despite two of them having been repainted red – mostly replaced by the newly delivered Ford R192s. As to Stratford Blue’s quasi-autonomous existence the answer probably lay with BET headquarters rather than with Midland Red, but it has never been fully explained and probably never will be. Although Stratford Blue bought Leylands almost exclusively from 1948 to 197 (82 in total), Midland Red bought more in 1952/53 alone, with their 100 LD8-class Titan PD2s. Final comment on this photo is that Warwick was rarely seen as a destination on a Stratford Blue bus – the hourly 90A from Stratford to Leamington passed through the town, but very few journeys finished there. This was most likely a schools journey. Just to say Kineton depot of Stratford Blue used white ticket rolls as did Stratford unless on local service then we had to change to pink. I may be imagining this, but there looks to me to be a conductor on board who is in the process of winding the destination blind – this would explain the ‘unlikely’ destination and the fact that it appears badly set. The ‘PAYE’ sign doesn’t look to be illuminated. Just to say Leyland Cub fleet number 44 reg no 2745 AC finished its days in the brook through bridge on Kineton to Radway Rd driver they say lost control DD number 31 turned over on Bourdon Hill towards Stratford this was a converted SD. I am trying to find out when Stratford Blue re-livered/painted their Leyland PD double deckers and included the newer Stratford Blue logo. I believe that originally the mudguards were black and at this time were re-painted blue, also the roof colour changed. I think it was in the early 1960’s but can’t find anything definite about it in the various books published on SB. Hope that you can help or point me in the right direction please.